Zoya's little black box with three lovely little bottles has been staring me down every time I sit on the couch. Tonight, I finally decided to confront it. The result is a pearly pink golden beauty of a manicure! I used Heavenly (Savina) as a base, and painted on a lovely light layer of Electrical Storm (Sation) over it. Then I topped it with the golden Gilty from Zoya. I used some different lighting to capture all the beautiful colors, but those are still my hands! 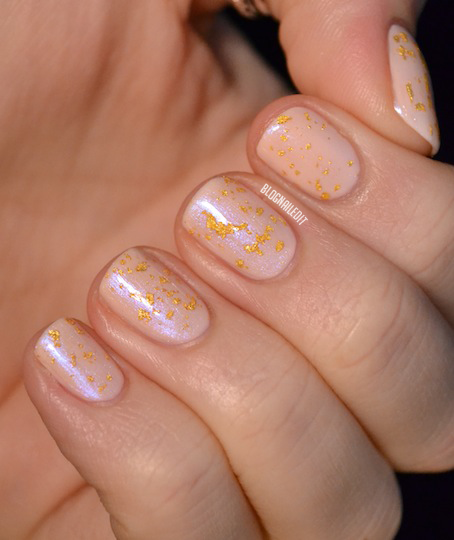 Does gold particles are very delicate, so this is a classy and elegant manicure! Love it! Running the risk of repeating what others have said, what a classy, delicate and elegant mani!! Looks festive yet not tacky. Wonder how that Zoya would look like on grey polish..
Love it! I think those colors together look great. Neutral and understated with the gold. Sometime I think the gold can look a little much but this looks perfect! The base shade you created looks lovely with Guilty over it - I have a shade somewhat like this base shade that I turn to a lot - it's a creamy white with a peach/oink cast to it - I am thinking it came out in an OPI summer collection that was the one about flowers - I cannot recall the name without looking it up - but it's the same one that has Come To Poppy in it - it was kind of the sleeper of the collection but I turn to it a lot. I have to pull that one out and use my Guilty over it - stunning - thanks for the idea! The gold shimmer is god-send. It compliments all types of color, but pink is drool-worthy. Lovely job !! This is so gorgeous!!! Just beautiful! A nice cute & girly look. I like it.